This section discusses general issues and frequently asked questions concerning the organizational workflow of Bachelor, Master and Diploma theses at our chair. Please read this page carefully before contacting one of the supervisors, so that you are well prepared when showing interest and discussing topics with the supervisors. Get in contact with your supervisor and discuss the topic of interest. You have 2-4 weeks time for consideration and to get already familiar with the topic. In these 2-4 weeks, if you decide to work on this topic, we expect you to write an outline of your thesis, which we are going to evaluate. 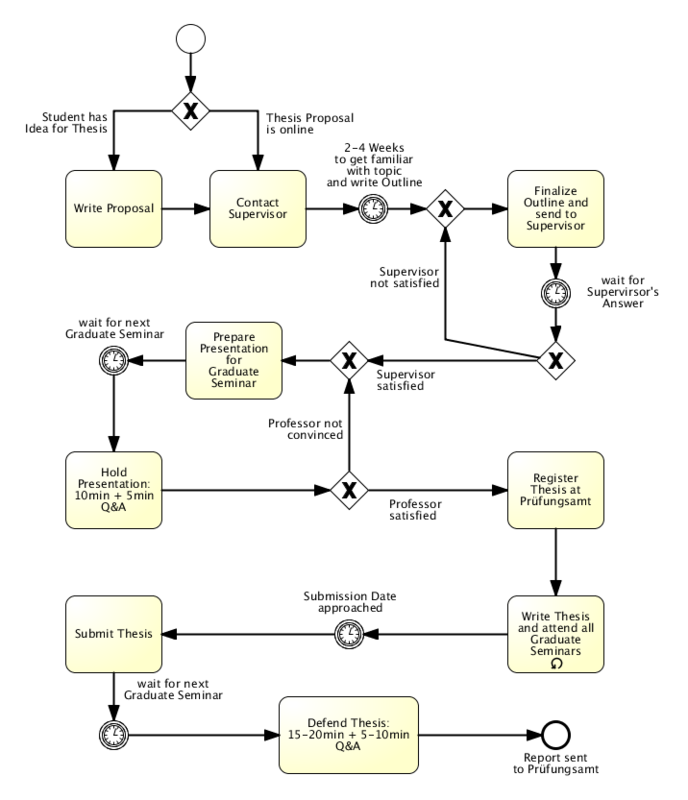 This outline helps you and us to clarify the work that has to be done throughout your topic. In the upcoming graduate seminar, you have to give an initial presentation of your thesis: 10 minutes + 5 minutes Q&A. If you get a final OK from the professor, you can move to Step 5. Register your topic at the Prüfungsamt (examination authority); from now on, it is required that you attend the graduate seminar (your email-address will be put on a mailinglist for invitations, please also check our webpage regularly). During the work, there might be several graduate seminars and meetings with your supervisor. Submission of thesis; now the attendance at the gradute seminar is not mandatory anymore except for your thesis defense. Bachelor students present 15 minutes + 5 minutes of Q&A, while Master students talk 20 minutes + 10 minutes Q&A. After the defense, a thesis report containing the grade will be sent to the examination authority. Please note that the submission must be at latest 6 weeks before the end of a semester to guarantee that you receive your grade within the same semester. Therefore the registration of the thesis at the examination authority must be at least 4 months + 6 weeks for Bachelor's theses and 6 months + 6 weeks for Master's theses prior to submission. Please use the LaTeX template for your thesis and also for your IOSL documentation.